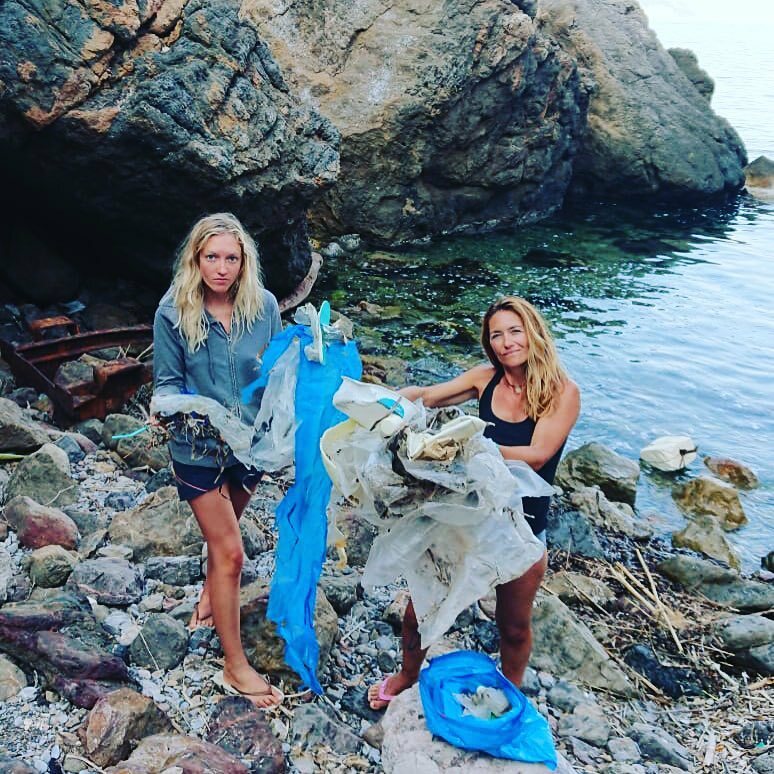 In May we told you about Cat Friend and Valerie Bisbal, and the epic adventure they were about to embark on to raise money and awareness of the ocean plastic problem. 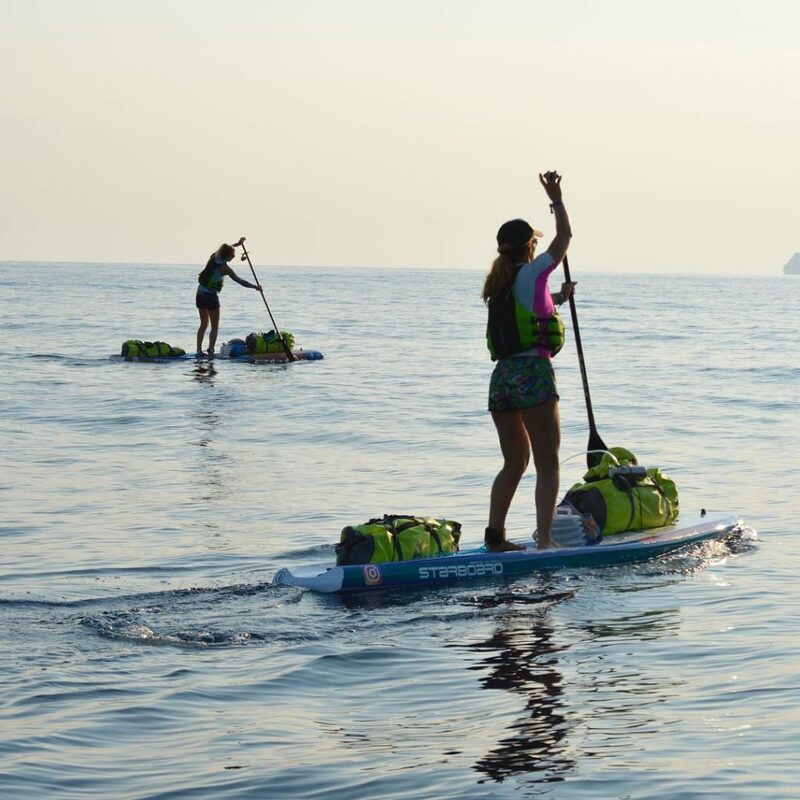 We’re really pleased to announce that they have completed their challenge, and achieved a world first by stand-up-paddle boarding (SUP) around the entire coast of Mallorca from Soller to Soller. Congratulations Cat and Valerie – an amazing achievement, and for a cause close to our own hearts. We’re pleased to have been able to help in our own small way, by providing ‘Unplastic’ McNair merino shirts to keep them warm and comfortable during pre-training. 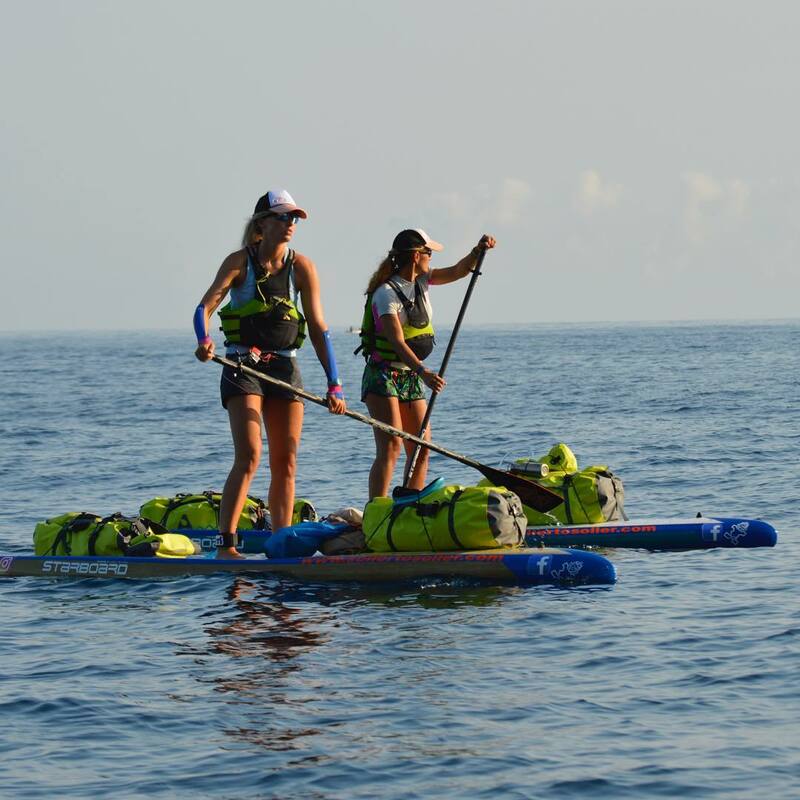 Two women SUP around the 555km coastline of Mallorca raising money and awareness for Marine Conservation. Cat Friend (British) and Valerie Bisbal (Mallorcan) have become the first people to circumnavigate the Spanish Island of Mallorca (Majorca) on Stand Up Paddle boards (SUPs). Previous attempts in 2015 failed. Leaving from Port Soller on June 1st 2018 they paddled the 555km coastline in 24 days. The two began training in February; a combination of paddle practice; weight training for strength and cardio for fitness. They took professional advice on their technique to ensure they could contend with the hardships of paddling up to 6 hours per day. The length of the event, stamina requirements, risks of weather, sea and safety put the adventure into expedition status requiring the girls to produce risk plans. The challenges include the Jurassic north coast where hostile 300 metre cliffs plunge directly into the sea permitting few places to shelter when the weather turns rough. Unseasonal storms at the end of the first week caused major problems for Cat and Valerie. There were three blank days due to the weather and for other days strong headwinds meant they only achieved half their target distance. Thunderstorms caused further down- time – as the two avoided the danger of lightning when on the water with carbon paddles. Scares occurred when being within 60 metres of a car ferry in Alcudia Bay and later finding themselves in a bloom of jellyfish where they had no choice but paddle on. Exhaustion, muscle burn, back and wrist strain caused them to contemplate, on several occasions, about their ability to achieve the goal. “On the seventh day we were quite downhearted” says Cat Friend, “the weather seemed against us, our bodies were suffering and camping overnight in poor conditions took its toll”. Overall the journey took 24 days involving up to 6 hours on the water each day, and 4-4.5 hours of purposeful paddling. Having trained and committed themselves and with the assistance of a sports physio they pulled through and once the weather improved they caught up with the demanding schedule. “We saw some stunning sights on the way” says Valerie “I have lived here all my life, but the chance to explore remote caves and coves was fantastic. We had clear blue bays, paddled with dolphins, manta-rays and in blooms of jellyfish but sadly we saw much more plastic than wildlife”. The expedition created a large following on Spanish, British and German social media, the girls were recognised around the island. Followers escorted them in boats across the bays of Pollenca and later across the shipping lanes of Palma. Life became a routine. Wake around 4.30am eat, apply vast amounts of sunblock and insect repellent. Check and recheck weather and wind forecasts. Paddle from 5 until 11am before the wind increased, regularly drinking water and eating energy bars. Then shelter from sun, eat, drink water, sleep for a couple of hours. The venture is in aid of Asociacion Ondine, a Balearic based marine conservation charity. The main aim is to raise awareness of the problems of plastic in the seas and oceans. Local schools have watched Cat and Valerie and invited them to come and talk to the children about the expedition and cause. Cat and Valerie used Starboard SUP boards, donated by the makers. En-route each girl carried 20kg of kit in dry bags and 7 litres of water. Other equipment included safety, camping and food as supply teams could not meet them every day. Each morning they would clean the beach they slept on; plastic straws, lighters, bottle tops and bags were the most common finds. “Finding so much litter on the beaches just spurred us on for the next paddle. If we can get people to see what we are doing and ask why then we’re getting everyone to think about plastic and the health of our oceans”. 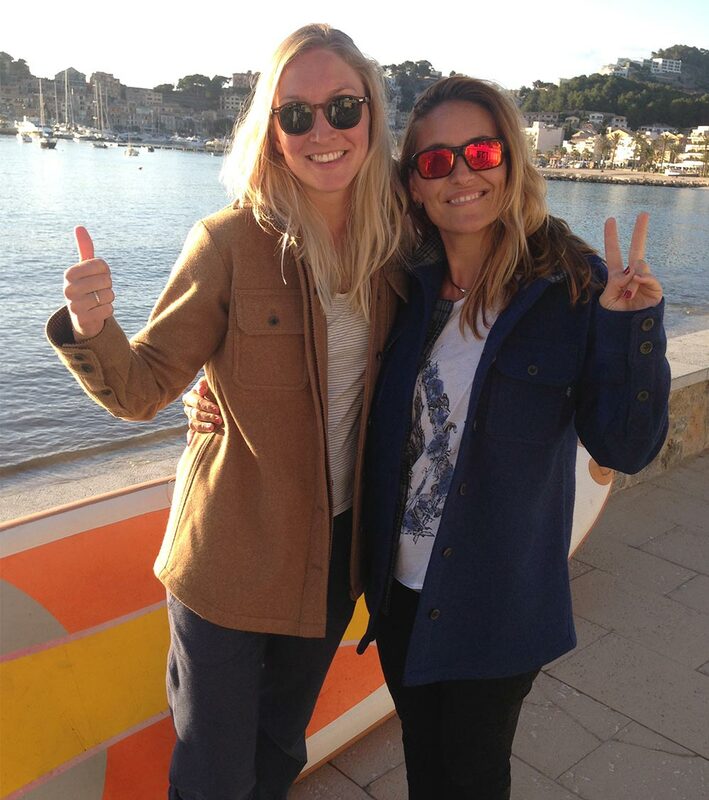 Cat and Valerie completed the round the island trip to a large welcome in Port Soller where boats, yachts, canoes and paddleboards escorted them in to the port. A crowd of friends and followers were on the beach to welcome them. “It was an emotional welcome” says Cat, “we were overwhelmed by the impact we had created, we hope we have done our bit for Marine Conservation – at least for 2018”. Catherine Friend (28) has a degree in Biological Sciences from Edinburgh University. Her prime hobby in life is sailing. In 2011 Cat represented her country (GBR) and came 4th in the ISAF team racing World Championship. In 2013 she won the Wilson Trophy. She took up paddle boarding in 2016. She took up paddle boarding in 2017 and, in April 2018, gave up her office job in London to complete the Soller to Soller expedition to highlight the cause of ocean plastic. Valerie Bisbal (41) has lived in Port Soller all her life. Married with 2 grown up children and a 5-year-old, she didn’t envisage being involved with a project of this scale. She has had to take time out from the family restaurant business in Port Soller to embark on Soller to Soller. Cat and Valerie met in 2017 when Cat was on holiday in Mallorca. They talked about the idea of going around Mallorca by SUP and worked on a plan. Once sponsors like Starboard signed up it began to take shape! Mallorca (Majorca to many people) lies 200 km off the south eastern coast of Spain in the Balearic Sea. It is a popular holiday destination for Europeans with more than three million German and two million British people visiting each year. Major holiday resorts include Palma, Magaluf and Pollenca. Port Soller the start and finish point of this venture is on the north coast surrounded by mountains. For further information see www.SollertoSoller.com or follow progress at facebook.com/sollertosollerSUP/ or on Instagram @sollertosoller. Information on Asociación Ondine is available through the web-site. The boards were provided by Starboard. They are leaders in environmental conscience within industry. For every board they sell they collect 2 kg of plastic from the ocean, or some 200 plastic bags per board.